Personalized lens printed retro sunglasses are hot party favorites and they can be gifted on all joyous occasions. “There is a sunglass for every occasion” stands true for these retro sunglasses, too. Be it a promotional event, birthday celebration, wedding or a awareness generation event, you can easily steal the show by wearing or gifting any of these personalized lens printed retro sunglasses. They are offered in multiple colors and print colors. We offer value discounts on bulk orders of this personal lens printed retro sunglasses. 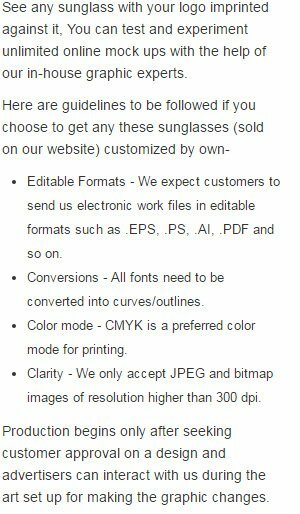 * Request a quote to know about price savings that can be availed on bulk orders of these printed retro sunglasses. Features – 4 Color process imprinting, throwback pinhole lens stickers. Imprint colors - Lens: 4 Color Process on a White Label Optional Temple: Standard Silk-Screen Colors. Production Time : 7 Days After Proof Approval. 10 days after proof approval when printing in multiple locations.